Staff manning twenty TASMAC shops at prime locations in Chennai including T. Nagar, Egmore and Anna Salai echoed the same views. The recent decision of Tamil Nadu State Marketing Corporation Ltd (TASMAC) to curtail the working hours of its outlets has had no impact on sales, inquiries reveal. 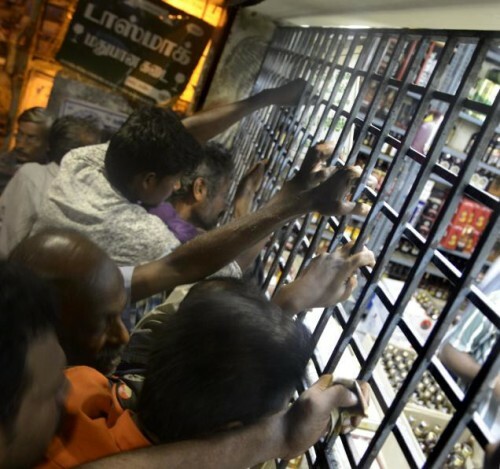 TASMAC, a government-owned company, has a monopoly over wholesale and retail vending of liquor in the State. For instance, at TASMAC’s outlet in Guindy, the sales have been consistent despite reduced operating hours. The salesman on duty, wishing anonymity said, “There was a slight dip during the first week when the government curtailed the operating hours. But it was not a drastic dip, just 2-3 per cent. Now, its sales as usual,” he said. This outlet churns out revenues of between Rs. 1.8 lakh and Rs 2.10 lakh on a weekday, which goes up by 10 per cent during weekends. A Manager at an outlet in Anna Nagar concurred. “People stand in queue by 11 am and when the shop opens at 12 pm, there is a huge crowd in front of the counters.” The TASMAC outlet at Chintadripet market saw its sales fall by 20 per cent in June. But the staff there said that sales have stabilised and the per day revenue is anywhere between Rs. 2 lakh and Rs. 2.2 lakh. “Our consumers are people who work in market areas. These people are now purchasing liquor the previous night and stocking them,” said the salesmen at this outlet. When asked for sales figures after the change in working hours and winding up of 500 retail vending shops, TASMAC, in reply to an RTI query filed by The Hindu, said, “The details are under audit.” To another query on revenue details of the 500 shops that downed shutters, TASMAC said, “Shop-wise revenue details are not maintained separately in our records.” The Managing Director of TASMAC did not respond to calls and text messages. Another senior TASMAC official said that data is available only till May 2016. “If you need more information, the Minister is the right person,” he said. A union member said that earlier, sales data was made available on a day-to-day basis, but for the last two months, the figures are being kept under wraps. “Unless the statistics are revealed, one cannot say whether the cutting down of time has really helped,” the union member added. As on July 31, 2016, TASMAC had 6,195 outlets functioning across Tamil Nadu.